NEW - QUARRY by J. Charles! 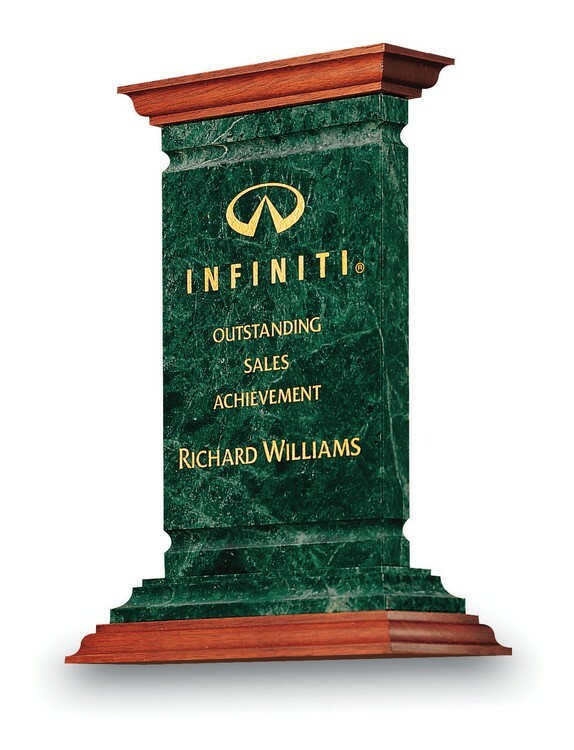 The Large Chancellors Green Marble Award combines genuine Green Marble with lustrous Mahogany stained American Walnut wood to create a most dramatic look that recognizes your top achievers. This Quarry by J. Charles exclusive is also available in grande and medium sizes. NO set-up charges, FREE Personalization, FREE Copy Change, FREE Monogram, FREE Color-fill and FREE Gift Boxes. IMPRINT: Deep Etched and color-filled in a 5"h x 3.875"w area on one side. GIFT BOX: All products packaged in attractive gift box with romance card inside and a gold embossed genuine marble sticker outside. Suitable for presentation and strong enought to ensure maximum protection.